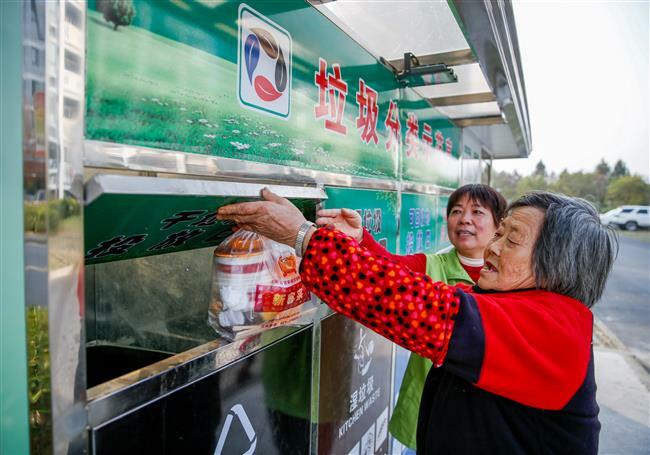 Sorting garbage has become a popular concept for residents in Songjiang's Yexie Town. Residents of Yexie Town throw garbage into garbage collection booth. Sorting garbage has become a popular concept for residents in Songjiang’s Yexie Town. Volunteers inspect trash bags to see if the garbage is wet or dry as residents claimed them to be. They would then throw the bags into the correct dustbins at the garbage collection booth and give residents points on their green accounts. “We did a garbage sorting trial at Zhennan Garden Community in 2016. But residents didn’t react very well. The garbage still needed a second sorting by our cleaners,” said Zhao Jianfeng, chief of community service center of Yexie. But the township authority persisted. From 2017 five garbage sorting trials were carried out at communities such as Shiji No. 1 Village and Shiji No. 2 Village. During a grace period officials reduced the number of dustbins from one set on each corridor to one set for every three to four corridors. They finally moved all the dustbins from corridors. The replacement of dustbins by garbage collection booths means a change in residents’ lifestyles. As garbage sorting is being carried out by more people, more green accounts are being distributed among residents. Some 93.3 percent of the households at Xinyuan Renjia Community have applied for a green account, according to Chen Ping, Party secretary of Shiqiang Community. “Points in the green accounts can be exchanged for goods or ferment made from watermelon peels, cabbage leaves or other wet garbage from the kitchens. While seeing the garbage turning into useful things, people’s enthusiasm in garbage sorting also increases,” said Zhao. “Cleaners in the community felt their work easier now. The time they used to spend on dragging garbage into garbage houses is saved and they can spend more time on patrolling and keep the entire community cleaner,” said Bao Yongxin, manager of the property management company of the Xinyuan Renjia community. “We also had to make sure sanitary workers transport the sorted garbage with different trucks, otherwise all the sorting work we did before will become meaningless,” said Bao.